I’m quite pathetic when it comes to cooking meat. I just don’t have it in me. Unforutnately neither does Jack – don’t tell him I said that though. The thing is, we just don’t tend to buy it. I’ll happily order a meat dish at a restaurant because I know it’s going to be so much better than my attempts. But when the email from Barbecoa arrived in my inbox telling me about a fantastic competition called #BBshortrib, I couldn’t resist. All I needed to do was pick five short ribs up from Barbecoa Butchers on Friday 10th February, cook them over the weekend and take them to be re heated at the restaurant on the Monday evening. It all sounded easy. As usual, I was slightly unprepared with my recipe but I knew I wanted to do something a bit different. I had a feeling that lots of entrants would be BBQing them, or braising them in red wine. 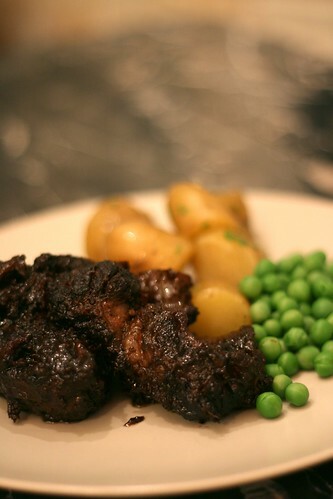 So I did something a little different – I braised them in ‘Proper Black’, a delicious dark pale ale from St Austell Brewery in Cornwall. The ale is black as stout and powerful hops dominate the restarained chocolate and coffee notes from the carefully selected roasted malt. This bottle had been sitting in my cupboard waiting to be consumed but rather than drinking, I thought this would be the perfect opportunity to do something a little different. After we (and the fire) had calmed down, we carried on and produced something utterly delicious. Thick, syrupy and rich, the sauce was to die for. The meat was tender and I was wondering why we don’t cook meals like this very often. Unfortunately we were unable to eat much of it as we had to reserve it for the all important judging the next day but the little bit we tasted whet our appetites! We were all set on the Monday, Jack was going to bring the ribs with him after work (he works from home) and I was going to meet him there. But disaster struck – at 5pm I still had not heard from him. When my phone went off shortly after, I knew something was wrong. Jack had been in a meeting all day away from home unexpectedly and there was not enough time to go home to pick them up and arrive at Barbecoa on time. The ribs were stranded in the fridge and we had to pull out. Disaster. I followed the competition on Twitter and was unsurprised to see that most had cooked BBQ short ribs. I wish we could have gone, it looked like a lot of fun. At least we got to enjoy our ribs for dinner that evening and I’ve decided that I’ll be taking a trip back to Barbecoa to explore other cuts and broaden my meaty repertoire. 5. 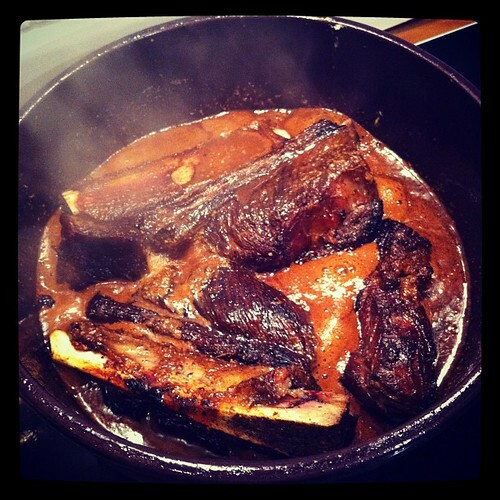 Cover and let simmer for 3 hours, turning the short ribs a few times while they’re cooking. The ribs are done when they’re fork-tender and falling off the bone.